Is there another art form in which longevity offers as many creative dividends as jazz? While the gruesome pantheon of players cut down in their prime dominates the music’s mythos, consider the honor roll of remarkably productive autumnal improvisers. Among tenor saxophonists alone, the octogenarian club includes James Moody, Jimmy Heath, Red Holloway, Benny Golson, Von Freeman, Sam Rivers, Frank Foster and Frank Wess. Jazz singers, however, rarely reach their later years with voice intact, which is what makes Cleo Laine’s resilient pipes and enduring creative drive such a miraculous phenomenon. At 81, the British vocalist still possesses one of the most glorious instruments on the scene, and she hasn’t lost a step on the bandstand (though she’s recently recovered from a broken leg sustained last December). Laine opens a four-night run at Jazz Alley on Thursday with her longtime West Coast band featuring pianist Larry Dunlap, bassist Seward McCain, drummer Jim Zimmerman and trombonist Ed Neumeister. Trumpeter Thomas Marriott leads an all-star lineup of musicians in a musical tribute to pianist and composer Horace Silver on Sunday, September 6th, 2009 at the New Orleans Creole Restaurant, one of Seattle’s longest-running jazz venues. The band will perform some of the best-loved songs by the jazz icon in what is certain to be one of the year’s most outstanding jazz performances. Featured on the bill alongside Marriott are Cory Weeds (Vancouver, B.C. ), Travis Shook (New York City), Matt Jorgensen and Phil Sparks (Seattle). Tenor Saxophonist Cory Weeds is considered the life-blood of the Vancouver jazz scene acting as musician, producer, club-owner, radio host and owner of a first rate jazz record label. 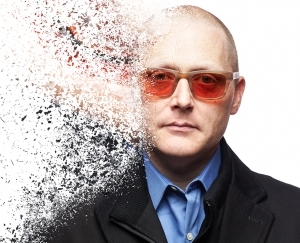 Pianist Travis Shook is a veteran of the New York jazz scene having recorded and performed with the likes Tony Williams, Benny Golson, Branford Marsalis, Joe Lovano and Toots Theilemans among many others. Drummer Matt Jorgensen and bassist Phil Sparks are the busiest in the northwest and beyond, performing regularly at international and national jazz festivals and clubs. Bandleader Thomas Marriott is a six-time Golden Ear Award winner who has produced two top-ten albums and has toured the world with some of the biggest names in jazz. This all-star lineup will perform works by pianist Horace Silver, a founding member of the Jazz Messengers who was instrumental in creating the “Blue Note” sound of the 1950’s and 60’s. He has recorded more than 25 albums for Blue Note Records alone and his compositions are some of the best-loved songs in the jazz lexicon. At 80 years old, Silver is well known for his humorous and funky playing style tinged with gospel, Latin and African musical elements. This amazing night of music takes place on Sunday, September 6th, at 8:00 pm at the New Orleans Creole Restaurant in Seattle’s historic Pioneer Square (114 1st Avenue South). The New Orleans features traditional Creole cuisine and full bar in a casual atmosphere. All ages are welcome. Reservations are recommended and can be made by calling 206-622-2563. Cover charge is $10.00. Set times are 8:00pm and 9:30pm. Pony Boy Records is very proud, once again, to announce the date for the Sixth Annual Jazz Picnic. Returning to Magnuson Park on Sunday afternoon, September 13, by overwhelming popular demand, the label is bringing another great line-up for this years’ Jazz Picnic featuring some of the Northwest’s finest jazz from the Pony Boy Records stable or artists. There will be CDs for sale and info from our sponsors, and hot dogs for sale. 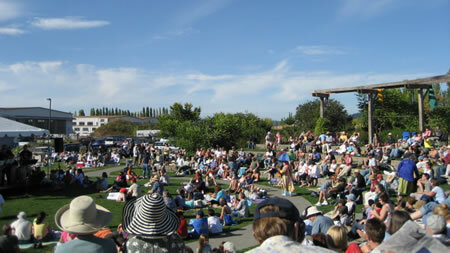 For the sixth straight year, join us for an entire afternoon of great jazz at Sand Point Magnuson Park’s Garden Amphitheatre. Pack a picnic or grab a gourmet dog from one our favorite food vendors and groove to performances by some of the Northwest’s top jazz artists in the lovely setting of the Garden Amphiteatre. jazz orchestra music of PBASBB, Jim Cutler J.O. and Emerald City J.O. with VICTOR NORIEGA, PETE PETERSEN, CAROLYN GRAYE, KAREN SHIVERS, GREG SCHROEDER, LEAH STILLWELL, TODD HYMAS, DARIN CLENDENIN and the superlicious talents of Alexey Nikolaev, John Hansen, Jon Hamar, Gary Shutes, Travis Ranney, Chuck Deardorf, Mark Taylor, Kevin Seeley, Greg Lyons, Thomas Marriott, Al Keith, Mike Mines, Jim Sisko, Reuel Lubag, Kobe Jazz Queen Whoopin, Chris Symer, Matso Limtiaco, Rich Cole, Susan Pascal, Tom Varner, Vanessa Sielert, Dan Kramlich, Ron Cole, Clark Gibson, Chris Amemiya, Dave Marriott, Dave Bentley, Chuck Kistler, Michael Marcus, Mark Ivester, Clipper Anderson, Marty Tuttle, Janette West, Dan Marcus, Craig Hoyer, Tracy Knoop, Mike West, Bryan Dickerson, Dante’s Inferno Dogs, more! A suggested tip-jar donation of $10 gets a discount on festival merchandise. It’s no coincidence that Terence Blanchard’s new album “Choices” arrives at a moment when the nation is in the midst of a roiling debate over how to reform the health-care system. That’s not to say the trumpeter and film composer offers an opinion on whether we should adopt a “public option” for health insurance. But his latest release for Concord Music is very concerned with notions of national dialogue, and questions about how we make decisions as a people. At its best, jazz embodies a form of radical democracy with every participant shaping the music’s flow in real time. On this recording, however, Blanchard wanted to explore democratic ideas in theme as well as in form. While most of the tracks on “Choices” are instrumentals, Blanchard programmed the album around spoken-word interludes by Cornel West, the prolific public intellectual, activist and Princeton University professor, while several pieces feature lyrics delivered by neo-soul singer Bilal. West won’t be on hand at Jazz Alley on Tuesday and Wednesday when Blanchard performs with his blazing young band featuring saxophonist Brice Winston, drummer Kendrick Scott, Cuban-born pianist Fabian Almazan, and Nigerian bassist Michael Olatuja, but his voice will be present via samples triggered by the trumpeter. For a high-school junior in the grips of a jones for jazz and sourdough pizza, the road trip made perfect sense. Omdal’s latest project, the Seattle Jazz Composers’ Ensemble (SJCE), was born on a similar quest. On the way from Seattle to a Port Townsend gig with pianist Mike Owcharuk several months ago, they came up with the concept of assembling an ensemble with the same expanded brass instrumentation as “Birth of the Cool.” The SJCE makes its debut tonight at Lucid Jazz Lounge, just north of the U District. The cause of his death was a heart attack, his wife, Patricia Ali, said. Mr. Ali was born Robert Patterson into a musical family in Philadelphia. He started out on piano and dabbled with trombone and trumpet before finding his way to the drums, which he began to play seriously while serving in the Army. The crowd was robust, lively and engaged at a recent jazz gig in Williamsburg, Brooklyn, and by the looks of it most people were in their early 20s to mid-30s — about the same age as the band members. It could have been almost any given night on the New York club scene, though you might not have had that impression, depending on your sources. But there’s a wealth of anecdotal evidence to the contrary, as many jazz bloggers and commentators, responding mainly to Mr. Teachout, have been quick to point out. Try dropping in one night this week at the Village Vanguard, where Jason Moran and the Bandwagon are appearing. Or head to the Stone in the East Village, which is likely to hit sweaty capacity for each set programmed by the young drummer-composer Tyshawn Sorey. Or stop by the Highline Ballroom in Chelsea on Friday night for a show by the Bad Plus. Scratch anywhere past the surface and you might begin to wonder whether the likes of Mr. Teachout and Mr. Gioia don’t see young people listening because they don’t know where to look. J&J Music & The Teaching are proud to announce the release of The Teaching’s premier DVD. The release concert is set for Monday, August 24th at the beautiful Triple Door music venue across the street from Benaroya Hall. During the concert scenes from the new DVD will be projected on the big screen behind the band. 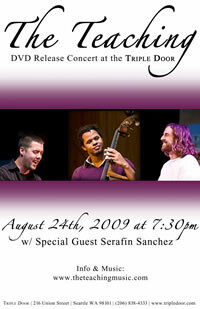 The DVD features footage captured from The Teaching’s CD release concert at the Triple Door last January, interviews with the band members about their weekly jam session called The Hang, and other special footage from performances, studio hangs and more. Please mark your calendars and join The Teaching as they play new music they’ve created over the past year. The concert will feature a special guest, saxophonist Serafin Sanchez, who they had the chance to work with last winter in Colorado. Make a reservation by calling Triple Door at (206) 838-4333 or click here.